The PF government now says it is not important to release the report on the fire that gutted the Lusaka City Market in July 2017 because it will not help solve anything at the market. Local Government Minister Vincent Mwale says government will just concentrate on solutions and preventing a repeat of such fires. Hours after the market was gutted government had immediately blamed the opposition United Party for National Development (UPND) for having caused the fire and President Lungu went on to declare a ‘Threatened State of Emergency’. 12 people were later arrested and linked to the fire but to date no update or report has been released by the police or government. Some of the accused were arrested in Livingstone, blindfolded and flown to Lusaka by the Zambia Air Force as they struggled to find who to blame. Lusaka City Market has remained in the same state after the fire and there is no sign of any reconstruction of the market. 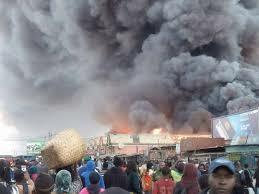 There is also no report of the moneys that were donated by various entities towards the reconstruction of the market.